A year ago, startup valuations hit a 12-year peak as the numbers of companies joining the billion-dollar-plus club soared. Today, those numbers are looking far more run of the mill. So suggests a new survey published by law firm Fenwick & West, which analyzed the venture financings of 195 Silicon Valley-based companies over the second quarter to draw its conclusions. Valuations also dropped, and pretty dramatically. The average percentage change in the share price of companies funded during the quarter showed a 40 percent price increase for the quarter, but that’s down from the 53 percent jump in price that startups saw in the first quarter and the lowest amount since the third quarter of 2010. 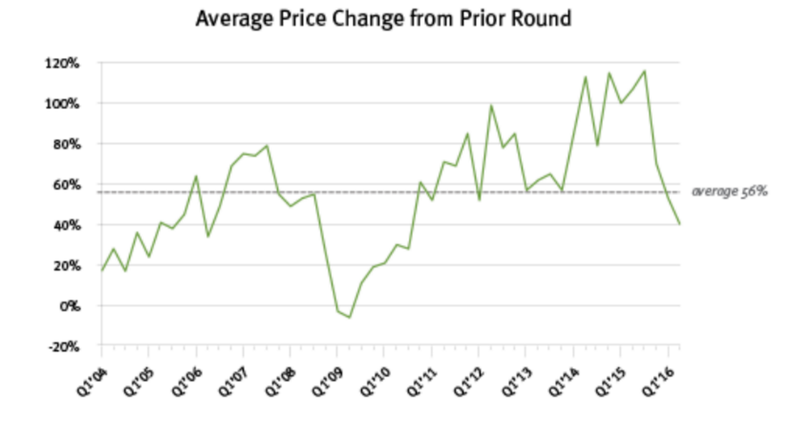 Meanwhile, the median price increase of financings in the first quarter was 31 percent, down from 36 percent in the first quarter. Kramer warns against drawing comparisons to the downturns of 2002 and 2008, noting that unlike both periods, when capital was in short supply, there’s currently plenty of money sloshing around Silicon Valley. Instead, he attributes falling valuations to human nature. On the one hand, investors are likely trying to figure out if there’s a valuation disconnect. On the other, many later-stage companies aren’t exiting through IPOs or M&A; that means investors who’d otherwise be focused on investing in and ramping up younger, newer startups are instead finding themselves spending more time with their older portfolio companies. Indeed, as TechCrunch reported last month, while there was a 3 percent rise in venture dollars put to work in the second quarter, that percentage was skewed by big investments in Uber, Didi, and their ilk. The number of global deal volume actually fell to a three-year low. For what it’s worth, deal terms haven’t changed much, which seems like a good sign for many startups. Asked if he was seeing an uptick in senior liquidation preferences — onerous terms that later-stage investors demand when they start feeling more nervous about the market — Kramer says he hasn’t. That’s “nowhere near” the number of deals that have included such terms during tough times in the past, he adds. You can find Fenwick & West’s full survey here.